A census was being taken. And there was an unmarried couple named Joseph and Mary who were about to give birth. They had to go and be counted, and so they journeyed to Bethlehem. But when they got there, there was no room in the inn. And so Mary had the baby out in a manger. Not long after, the angels went to the shepherds and announced the birth, and they came and saw the baby there. And the baby was named Jesus. We know this story. But every year we read it anyway. And, not to take away the suspense, but if you come back here a year from tonight, we’ll be reading it again. Part of the reason is that it’s the only one we have. A lot of people have asked me during the course of ministry, why does the Bible end when it does? We have the New Testament with all these books written back in the first and second centuries, but then we have nothing. It’s almost as if the story ends. We don’t get an update each Christmas on what’s going on. We don’t get a Christmas letter filled with news from Jesus. We don’t get a new version of the Bible delivered every December. And so every year we read this story again. You might be wondering, what’s the point? The story never changes. And if you’re talking about the words found here in the Gospel that we read every year, you’re right. But if you’re talking about the real story, the bigger story, the story about Christ’s birth and what came next, then that’s different. Because the Christmas story does change from year to year, and I’ll tell you why: The Christmas story changes, because we, you and I, change. You know that question about why the printed story ends in this book? I think it’s because of this. I think it’s because this book tells the story of Christ’s first followers, back when there were only a few. But not long after this, a lot of other people got to know about Christ, and got to know the story of the first Christmas. And if we told the stories of all the people who have come to understand what the baby born that night was all about, if we tried to write them all down, one book would not contain them. 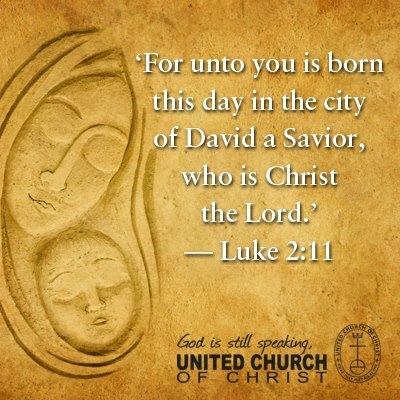 The national denomination this church is a part of, the United Church of Christ, has a motto that we use. We say, “God is still speaking…” And by that we mean that God did not stop being active in our world and in our lives 2,000 years ago. We mean that God still is working in this world. God still is transforming it, and transforming us. God isn’t just in the past. God is here now. And we, the people of a still speaking God, are still listening. And we are still hearing the stories, not just ones written so long ago, but also ones all around us. And even if this story we hear on Christmas eve every year isn’t changing, we are. And the most miraculous part of it is this: If we are really changing, if we are really being transformed by God’s love for us, then we are becoming people who not only listen to the Christmas story but who also become a part of it ourselves. If you are truly want to get to know that baby who was born 2,000 years ago, if you truly want to follow the person he grew up to become, then you cannot help being changed. And you cannot help becoming a part of his story. And that means you cannot avoid becoming part of the greater Christmas story, a story of hope, and peace, and joy, and love. And that’s a good thing. Because the world needs all of those things in abundance right now. The past few weeks, we’ve seen that so clearly. One of the reasons that I believe the Christmas story still matters for us is that I believe God cannot be done with us if we are still inflicting pain on each other. God cannot be done with this world. And that means that God’s people cannot be done working to transform it either. And that means that you and I, the people who come to celebrate the birth of a child so long ago, have some work to do. And we have a story waiting for us to become a part of it. The child born tonight grew up to be a man who told us to live lives of peace. Who told us to love our neighbors as ourselves. Who told us to turn away from things that ultimately mean little, and instead turn to what really matters; to turn our hearts towards God and towards one another. This time of the year, we sing a lot of carols about that child. We celebrate in ways we don’t the rest of the year. And we talk about things like peace, and joy, and hope. But if we really mean it, if we really want to be a part of this Christmas story, then we can’t pack those things away next week along with the wrapping paper and the ornaments. We have to be a part of this story every day, and not just every December. If we are truly doing that, then we will have incredible stories to share ourselves. Stories of kindness and compassion where they were totally unexpected. Stories of generosity in times of scarcity. Stories of peace in a time of violence. Stories of hope in our darkest hours. What if you were to tell the second part of the Christmas story tonight? What if you were to read this passage we read tonight, and then you were to say, and here’s my second part. Here’s my story about what happened next. Here’s my story about how the love and life of this child born tonight has changed me. Here’s what happened when this Gospel story and my life’s story intersected, and everything changed. The story is the starting point. But you are what happens next. Christmas is not just about the story of Christ being born in a manger 2,000 years ago. Christmas is about the story of Christ’s love being born in our hearts everyday. And it’s the story of how you respond. Not just tonight, and not just tomorrow, but everyday. Next December 24th, I invite you to all join us back here once again. Here’s a spoiler: We’ll be reading the same story. But it’s just the start of the story, and between this year and next year, your Christmas story will have changed. And the more that you open your hearts up to Christ’s love this year, the more you let it be born inside of you, the better that story, your story, will be next year. May Christ’s light shine in your hearts brightly this Christmas eve, and may it shine ever brighter in your lives, and in our world, all through the year. Amen.